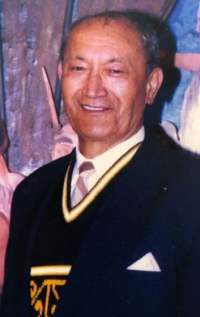 "Kua hinga te totara rangatira o te wao nui a Tane"
It is with a heavy heart that the whanau of Jack Tomairangi Raharuhi Te Whaiti, born 29th April 1936, passed away peacefully surrounded by loved ones, on Tuesday 5th of February 2019 in Wellington ICU. Jack was the Loving husband of "Mum" the Late Lucy Ruihi Te Whaiti (nee Turei) and "Ma" the Late Nancy Te Whaiti (nee Pirere). Jack will be lovingly remembered by his sisters, Piki Rauhina, the Late Reremoana, Lydia, Elizabeth and his late brother John. He will always be dad to his children, Mereana, Meranea, Amiria, Josephine, Gabrielle, Rose, Regina, Teresa, Maire, Mark & Prince as well as his Daughter & Son in-laws. Koro Jack will be loved always by all his Mokopuna, Mokopuna Tuarua & Mokopuna Tuatoru. He will be laying in state at Papawai Marae, Pah Road, Papawai (near Greytown) from Tuesday, 5th February. Tangi will be held on Friday, 8th February at 11.00am, followed by Hakari at Papawai Marae. The whanau have decided that on Friday, the day of the Tangi, you are invited to join us dressed in "Hawaiian" style to honour and celebrate our Koro Jack. Messages to the Te Whaiti whanau C/- PO Box 185, Carterton 5743 or may be left in Jack’s tribute book here at tributes. The whanau of the late Jack Tomairangi Raharuhi Te Whaiti, wishes to acknowledge the many expressions of sympathy and gestures of kindness shown to us following our sad loss. We offer our heartfelt thanks to the Wairarapa Ambulance Service, Greytown Fire Department, Westpac Helicopter Trust, Wellington Hospital Nurses & Doctors (A&E) (ICU), Richmond Funeral Home, Arbor House & Greytown School. A special word of thanks to our, Aunty Nana (Piki Rauhina) & Whanau Winitana, Uncle Koro, Uncle Haami, Whanau Turei, our minister William Charles Goldsmith, Uncle Colin, Aunty Selena & all our Mokopuna Tuatahi & Mokopuna Tuarua for endless Aroha & Awhi. We are truly grateful. For those who telephoned, travelled long distances, sent floral tributes, cards and messages of condolences, as well as those who made Koha Aroha and Koha Kai, “E rere ana te mihi maioha"